Emerging Markets – Emerging Opportunity? Anybody who has invested in emerging markets over the last few years will tell you they have been killed. Investing in emerging markets has been a small part of my diversification strategy, so while it has not been a winner I see it as a cost of diversification. While the point of this article is that India is the winner so far in emerging markets investments, the recent uptick in the other BRICs was what interested me. Yes I think India is an interesting investment opportunity – but so does everybody else and thus its pretty high priced compared to other companies. One of the other sites I check in periodically is this Star Capital page showing worldwide market valuations. Note Russia, China and Brazil are the 3 cheapest equity markets in the world using this sites scoring system (which seems fair). India is not shown – as it appear at #32 right ahead of the US at #33. Yes Russia, China, and Brazil all have their warts and reasons not to invest in those markets – but the valuations when compared to India are intriguing. For contrarians who believe the uptick of emerging markets is not just a blip but a trend, one would have to think there is an opportunity here. In the mid-’80s the IMF made an attempt to understand financial markets. And I was sent to talk to asset managers in New York. The question was asked to them: “What was the first thing you did when you heard Mexico wouldn’t be able to meet its debt repayments?” — which happened in 1982. And the asset manager said, “I sold Chile.” To an economist, this made no sense. Chile was a very well-managed economy; it never had to restructure. So the economist in me thought, “Wow, this is a difficult, irrational market participant.” But he explained, “Look, I manage Latin American funds, I believed, and it turned out to be the case, that some of my investors, when they read about Mexico, would take their money out of the fund. I didn’t want to be left with an over-concentrated position so I got ahead of that trend by selling Chile and some other winners.” And I remember being amazed that there was this whole other dimension out there that goes beyond economics and policy, and it goes back to the idea that how you think about things is very important. Like the game of chess – economists have to think a few moves ahead to visualize the future. Predicting the future is fraught with error, which is why so many smart economists see a wide variety of futures. So when I hear about how the world is overleveraged in a declining growth environment, and this portends bad news for the future, I have been trying to make sense of who the world winners and losers will be. One of my favorite sites for this is tradingeconomics.com where you can easily see world economics to try to understand bond valuations. 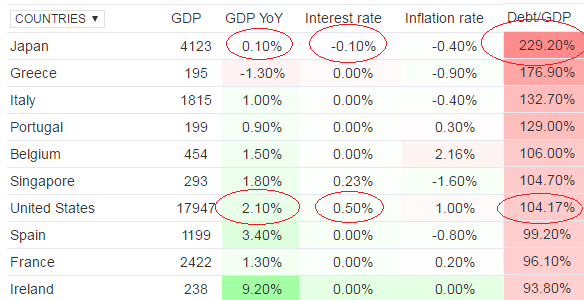 Japan, with the highest debt to GDP, and lowest GDP Growth, has the lowest interest rate. Looking at this chart, why would anybody own Japanese debt instruments? 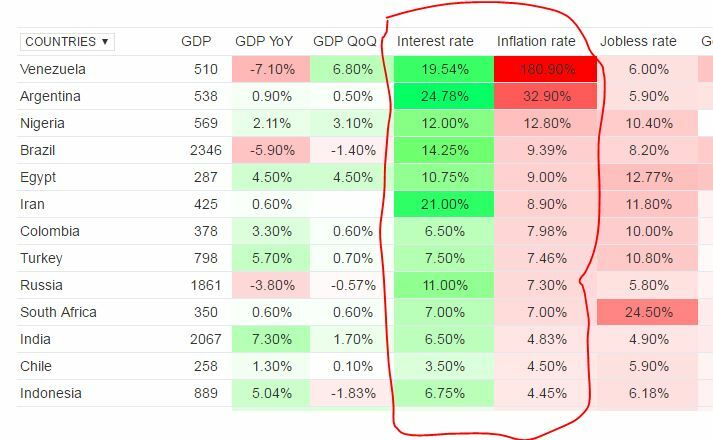 While its sad to see the US in the top 10 of this list, arguably it is the safest bet – highest GDP growth, highest interest rate, and (relatively) high inflation rate – which is important for highly leveraged companies to inflate their way out of debt. I think current world bond pricing is ignoring soverign debt default risk, and I can’t explain it. If fact, when the Brexit results came in, Japanese Yields went down as investors switch to Japan in a flight to safety. So I don’t get it, but I do think markets will correct and debt quality will become a factor in bond pricing. And when this happens, world markets will be in turmoil.